Love a pet but don’t like the name the author chose for it? Check out the quick guide to renaming things! A feature-rich dog/husky follower with many appearance options available, both lore-friendly and unique. Doesn’t trigger traps, has max stealth skill, and is overall a very well developed follower. While my criteria for most of these mods is that they add new animals rather than editing existing ones, this one was too good to pass up. Adds a variety of unique appearance options and features to vanilla dog follower Meeko, including a summon spell, enhanced stealth, and making him essential so you never have to worry about Meeko dying on you again. 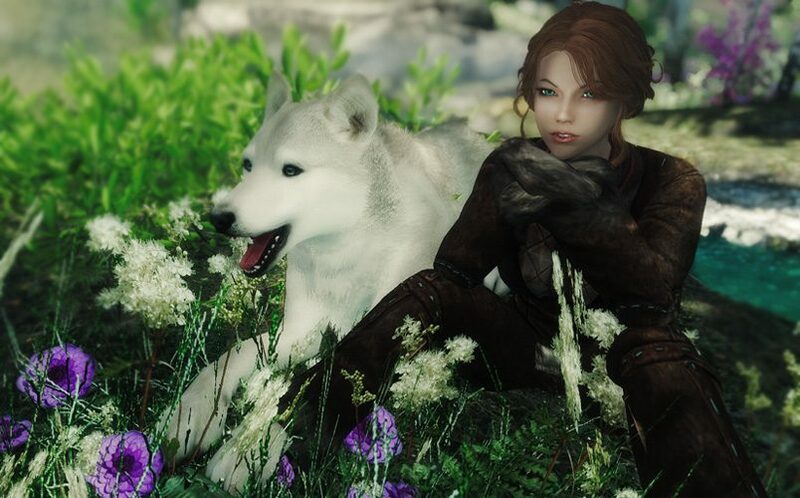 Just like the above mod, adds a bunch of useful features to the vanilla dog companion Vigilance: unique appearances, cannot be killed, ability to call him to your side, and more. An icy themed wolf follower, Fenrir has a unique appearance and the ability to cast several frost spells. Also comes with his own summoning spell. A simple black and white husky companion with HD fur and eye textures. Has a few appearance varieties, such as with or without armor, and eye color options. Doesn’t set off traps or stealth meter. A German Shepard Dog follower with enhanced attacking abilities and custom dialogue commands. Several cute appearance options for vanilla dog Meeko. Also makes him essential and allows him to level with you. Adds a small dungeon that, one completed, allows you to recruit several wolf companions. Also includes options for allowing several wolves to follow you. A cute Shiba Inu follower dog. Has optional black fur version. 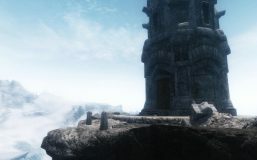 Adds a family of German Shepard Dogs to Dragonsreach in Whiterun, with a couple different appearances. A dog with many unique features, including its own blanket and food bowl, loyalty system, and feeding requirements. An essential, flaming wolf companion. For when you need a dog that’s also on fire all the time. As the name implies, a dog with a custom textured black and white coat pattern. Also has a brown version of the same texture. A wolf with a very unique design and textures based on a Japanese deity. Comes with its own MCM menu for customization and a summoning shout. A unique looking spectral dog follower, with custom dialogue options. A feature-rich sabre cat follower with his own bonding/perks system, texture options with in-game selection, and custom commands. Adds all sorts of domestic and wild cats to many areas in the game, including purchasable/adoptable cats. A rideable sabre cat with enhanced health regen, summoning spell, and item to enable/disable following or waiting in a specific location. A panther follower with custom appearance/meshes and craftable collars. Adds a sabrecat follower with custom sounds, textures, dialogue options, and is essential. A summonable panther follower with custom dialogue commands. Unfortunately only lasts for 6 hours per day, but can be resummoned daily or force-recruited with a follower mod like EFF to last permanently. A cute house cat follower with several color options. A simple brown bear follower who can carry your things and never dies. A feature-rich bear follower that you raise from a cub. Can be dynamically renamed, fed in order to grow, and ridden as a mount when he reaches adulthood. A bear wearing the iconic iron helmet. Can be summoned, has several color options, is essential, will carry your burdens, and can also be transformed into a werebear. Adds an essential chicken follower who will attack with you in combat, can carry your burdens, has a cute helmet, and can also be upgraded to learn spells and shouts. A very strange follower with an assortment of … interactions. Best to have a look at the mod page and decide if this level of chickinsanity is what you’re looking for in your life. Like it says on the tin, an essential chicken follower. Punch it to receive chicken eggs, because why not? A fox with a variety of appearances and magical abilities that can be changed in-game by providing it with elemental salts. A fox follower with custom textures and voice. Also comes with her own home and a transformation spell to turn the player into a fox. A simple arctic fox follower with his own summoning spell. A custom textured grey/brown fox companion. Essential, can carry your things, and won’t set off traps. A large fox companion with a variety of features, including its own inventory, favor system, house assignment, and can be ridden as a mount. A charming goat follower with a backpack for carrying your burdens. A pig follower that will carry items for you and follow you. She doesn’t use an animal slot for followers, so you can keep her and another animal. Inexplicably speaks with a female dark elf voice. A simple mod that adds an essential goat follower with literally no other features. Adds an absurd amount of rabbits and rabbit-related things, including a variety of (adorable) follower options and appearances. Also check out the creator’s other mods for more animals. A non-combat bunny follower with custom meshes and many appearance options. Rabbit Ranch – Bunny PetsAdds six essential rabbit followers using vanilla meshes and textures, and a small farm that they can be adopted from. A mudcrab follower who is essential, has custom dialogues, can carry items, and will assist in combat. Adds three recruitable mudcrabs who can each use a variety of shouts and spells for maximum mudcarnage. A fast moving mudcrab who can equip select armors, such as shields and backpacks – for maximum adorable. Yep, just like it says. A Dragonborn DLC style spider companion who can carry items for you and is essential. A shock spider from Solstheim who can perform most typical follower duties and is essential. Adds a spriggan named Vilya who will heal and restore the mana of your character and any other nearby allies. Also removes the “buzzing” sound from spriggans’ attacks. Allows you to rescue and recruit the spriggan in Snapleg Cave. Uses a vanilla human voicetype, is essential, and can perform standard follower actions. A spriggan with her own custom textures, recruitable after a small dungeon. Uses the follower slot for animals, is essential, and can carry your things. An adorable/unqiue penguin follower who will fight at your side. A custom voiced slaughterfish follower who wears a dapper top hat and walks around on mechanical dwarven legs. Truly a marvel to behold. A horker follower who will accept very basic commands and is essential. Nothing terribly special, but horker followers are apparently a rarity! A unique nix hound follower straight out of Morrowind. Functions the same as a typical dog companion. A lovable netch follower recruitable in Riverwood who will help you in combat. A custom voiced teddy bear follower with a variety of customization options, including unlockable outfits and a summoning spell. He can also ride on your back. Five miniature walking mushroom companions to accompany you on your travels, functioning similar to animal followers. A unique follower that is literally a cute custom lamp on a pole. Provides light, and has an optional unique walking sound. A cute, tiny stuffed sheep follower that performs all normal follower functions and speaks with the female young voice type. A unique and definitely not lore friendly little robot, with optional colors and head-turrets. Head turrets! A flame atronach companion with her own small unvoiced quest/backstory. A wisp companion who will fight with you and carry your items. An intimidating skinned dog/death hound follower based on Oblivion’s Shivering Isles’ pet. A female-looking dwemer droid follower who uses the female dark elf voicetype. Is marriable, essential, and uses spells in combat. A unique companion intended to carry your numerous burdens with its near-infinite storage space. Has two appearance options and comes with a summoning spell. Three dwemer-style dog followers who use dark elf voice types. Can perform all typical follower actions and are essential. A comprehensive mod to allow you to build your own dwemer companions from items forged and found in the world. Each type of follower has its own unique uses/abilities, and most have several upgrade options as well. Three female-looking dwemer droids with custom appearances and magical effects. Found outside of Whiterun, which is slightly awkward. 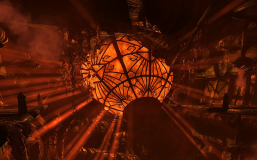 A dwemer sphere follower who is essential, can carry your things, and other normal follower stuff. Speaks with a human male (drunk) voice. Adds a dog and fox follower, with tons of texture options for both and a huge amount of features: unique traits/bonuses for leveling up, summon whistle, custom combat options, and lots more. Adds a huge variety of pets and a sanctuary for them in the Whiterun tundra. All pets are non-combat, and will simply follow you and keep you company. Includes appearance options for several pets. A small collection of pets that you can pick up at Eldergleam Sanctuary. All pets are essential and will fight with you in combat. Thanks for the list. I love animal companions. Gonna give this one a shout out out cos I think it deserves more credit. Caius the Foolhardy Fox by theBreadthief. Not totally bug-free does have a few unique functions – unusual appearance, flame or ice powers depending, turns black when go into sneak mode so great for thief-like players.